Whether it be searching for an effortless outfit for a beach getaway or an outfit for an event, your accessories should always harmonize. Be it searching for a new cocktail dress or beach cover-up, you’ll always want to have go-to pieces for every occasion. Finding ‘the’ dress or bathing suit may be difficult; you’ll always have a great staple to count on with Wrap Ring. Sometimes it can feel like a job finding the perfect outfit, but a way to style your summer excursion is to use your Wrap Ring as the inspiration for your outfit- no matter how glamorous or spontaneous the event may be. So how do you adapt to trends? Although fashion trends may come and go, your accessories should be able to take you through the ever-evolving fashion world. Although polka dots and off-the-shoulder pieces are at the top of the charts during these hot months, they may fall to the back of your closet by the end of the summer. There is also a vast array of prints and cool colors that are very popular this summer. Adding another burst of color or simple, but delicate crystal, will add to the outfit, and think of the Wrap Ring, as your side kick in this journey. It can be an easy, but essential, addition to your outfit, almost like a scarf around your neck or your cross body bag you’ll use on every adventure. The great perk to your wrap ring is the adaptability with other metals and a simple addition to any outfit, casual or chic. The Wrap Ring store is tailor-made to ensure you’ll find a match that will fit with any of your outfits seamlessly. Don’t believe that it will go with your new clutch or printed sundress? 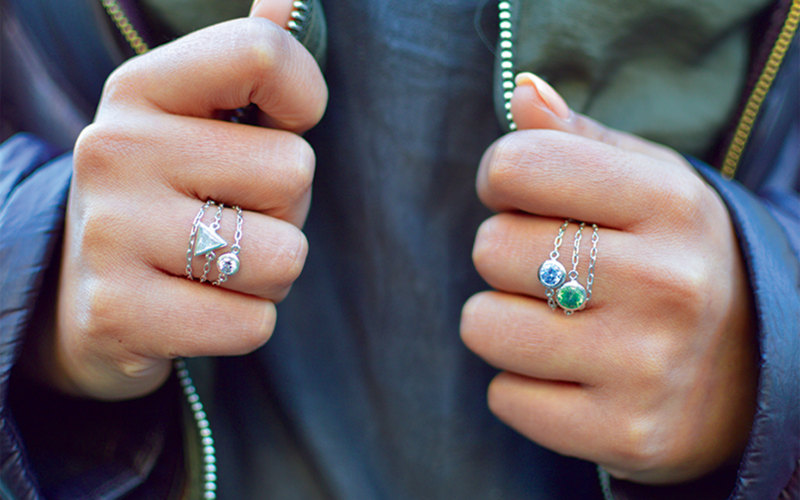 An inspiring way to get a sense of ways to wear a Wrap Ring is checking out our Instagram . Or for a more tailored taste, head to our Wrap Ring store to check out each ring by color or by shape: With illustrations and descriptions that will fit your personality and functionality.